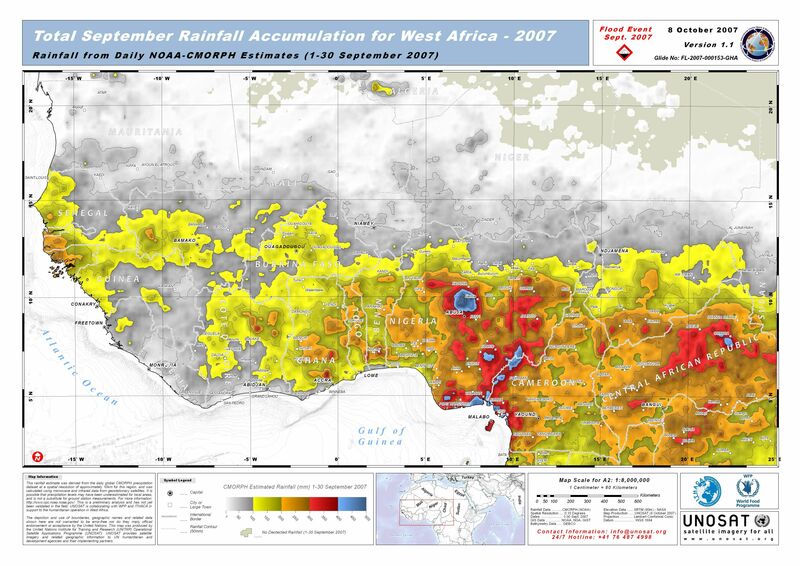 This map illustrates the total September rainfall accumulation for East Africa, derived from the CMORPH precipitation dataset at a spatial resolution of approximately 10km for this region, and was calculated using microwave and infrared data from geostationary satellites. It is possible that precipitation levels may have been underestimated for local areas, and is not a substitute for ground station measurements. For more information: http://www.cpc.ncep.noaa.gov/. This is a preliminary analysis and has not yet been validated in the field. UNOSAT is collaborating with WFP and ITHACA in support to the humanitarian operation in West Africa.